Hillary Chybinski: trying new things. . .
trying new things. 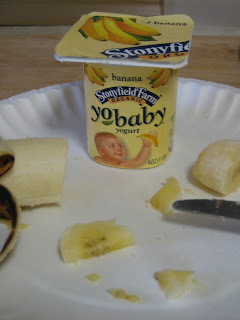 . .
yogurt and bananas for owen, maybe a new party location for ryan's birthday, and house rules for all of us. not sure yet on the house rules. . .my thinking is if they are written down and posted - there should be no question. my dilemma now is what to do if you break a rule. . .i'm thinking three strikes and you're out. . .what do you do? We don't have any WRITTEN rules, but the kids both know the rules by heart. I try to keep them few and simple so that compliance isn't too difficult. They also know the consequences for breaking rules. Stay at the table until an adult says you are done. For fisrt level transgressions, time outs are used. Second level transgressions cause the loss of privliges like XBox or doll house. Are you having a specific problem you are trying to address?